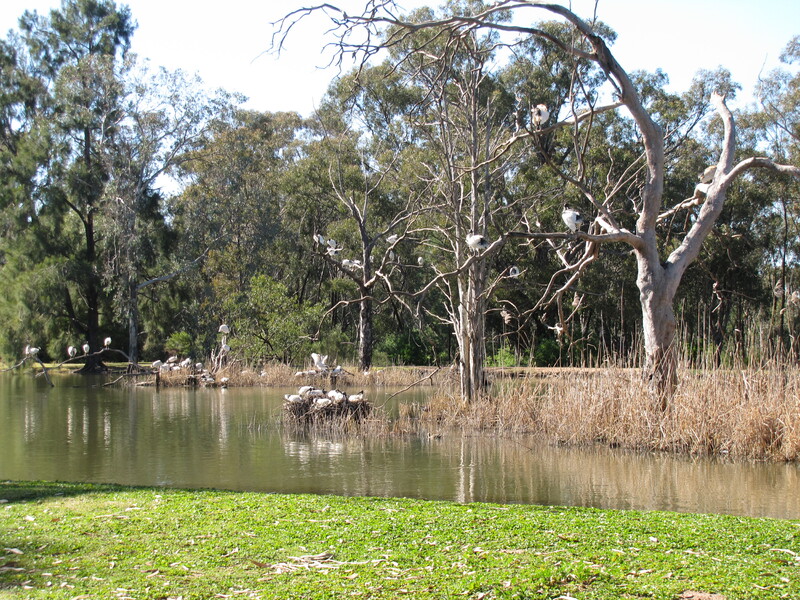 Some time ago I wrote a few posts here on our visit last year to the Western Plains Zoo in Dubbo. This zoo is an open range zoo which complements the Taronga Park Zoo in Sydney. As we had never been to this zoo before we were looking forward to our visit over two days – tickets are valid for two days which I think is a great idea. One needs two days to see everything but we only had an afternoon and a part day due to a funeral of a family member. Our planned visit to this area fortuitously coincided with the family getting together. For my readers who may not know much about this zoo, it was established many years ago by Taronga Zoo. It is situated a few kilometres south of the rural city of Dubbo which is on the western plains of New South Wales about a five hour drive from Sydney. The animal enclosures are quite large and visitors are able to drive their cars from one enclosure to the next. Going via bicycle is another popular method and these can be hired for the day, or you can bring your own. Some energetic people even walk from one enclosure to the next. On our visit we stopped to have lunch by one of the lakes which have been built in the zoo property. This lake has become a well occupied wetlands area. 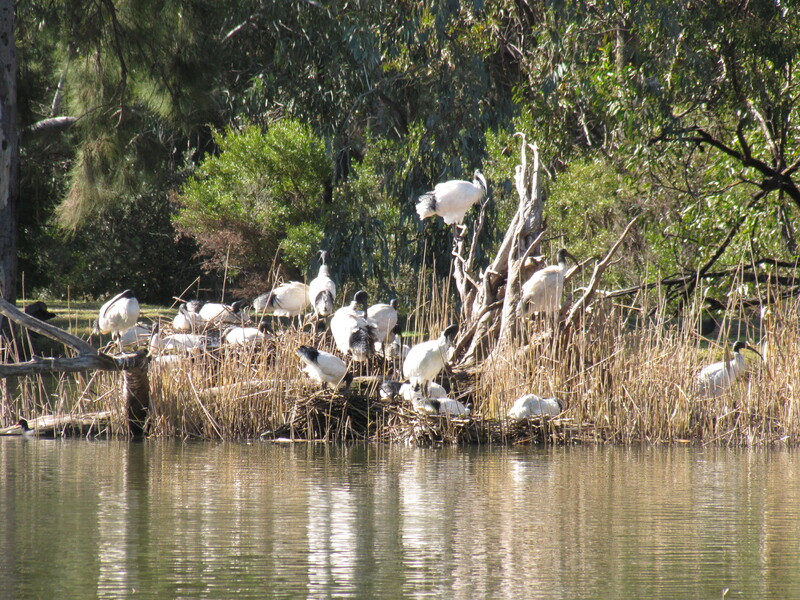 My interest was mainly in the birds present, but I am sure that many other creatures inhabit this wetland. 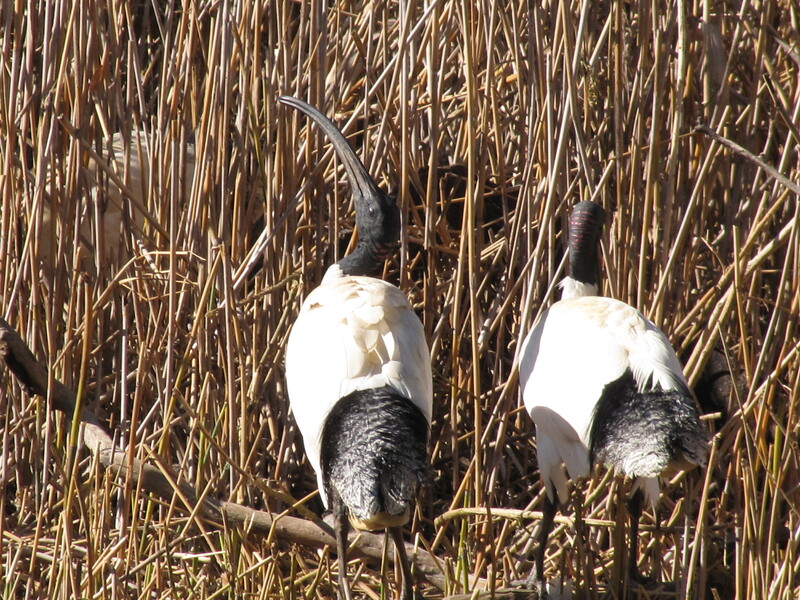 The most prominent bird present was the White Ibis. In today’s photos I have shown some of them on nests in the reeds as well as general shots of the colony. Over the past month or so the area around our garden has been full of birds nesting, sitting on eggs, feeding young or busy feeding the fledglings after they leave their nest. Spring time here in South Australia is the main breeding season for many species of birds, especially the bush birds. Many of our trees and shrubs are also flowering which means plenty of food for the birds, both the nectivorous and insectivorous species. Here is an annotated list of the species I have observed nesting or feeding young this spring, plus a few species I suspect have been nesting nearby. All of these observations have been in our garden or on our 5 acre property in Murray Bridge, South Australia. Willie Wagtail – the photos of the nest (above and below) on today’s post are of the nest with two babies just peeping over the top of the beautiful cobweb lined nest. They have since fledged and are flying around begging for food. House Sparrow – these seem to be always nesting, not just in the spring. Common Starling – about a dozen tree hollows had nests in them and it is quite obvious when there are babies in the nest; their calling for food is incessant. Most of the starlings have now flown off to the fruit growing districts nearby. 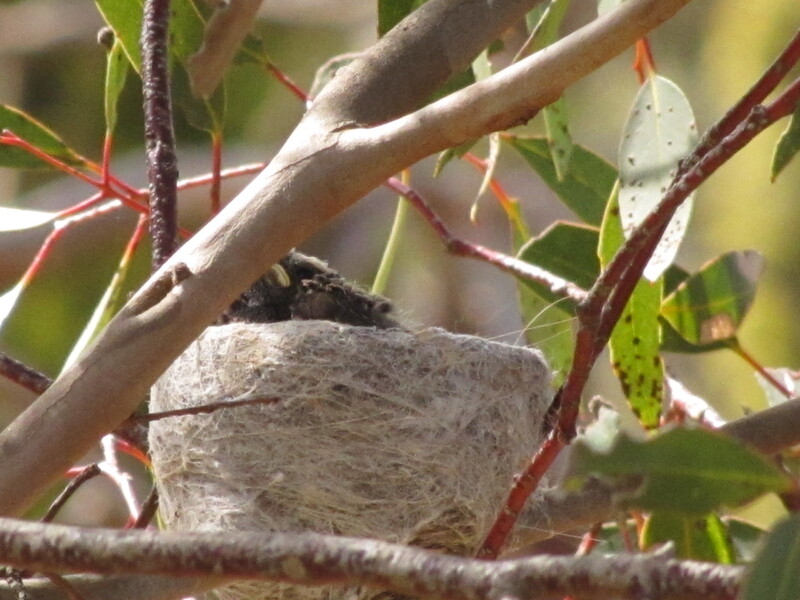 Red Wattlebird – there have been several fledged young wattlebirds getting around in recent weeks. I suspect that the adults may well be nesting again. The male continues to boss all the other smaller species quite unmercifully. They don’t like sharing their food, even though there is plenty to go around. 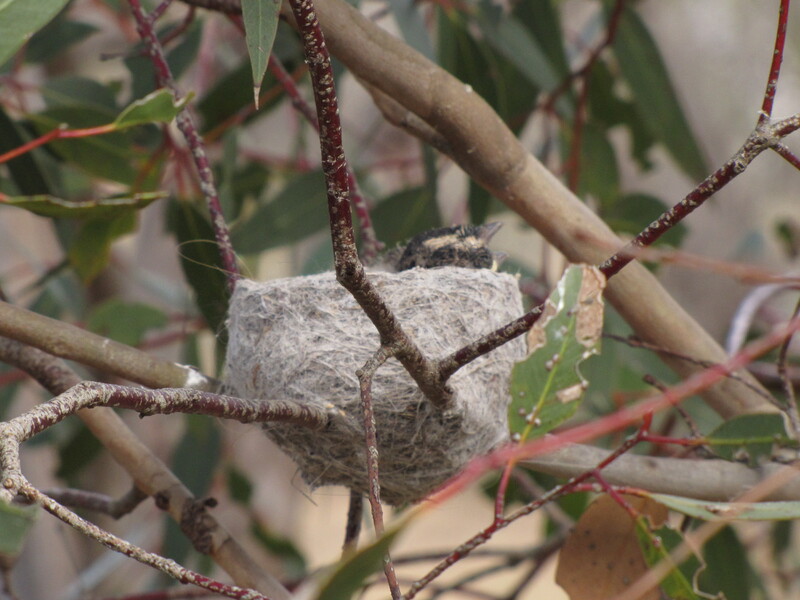 New Holland Honeyeater – I saw several parents feeding young just out of the nest quite a few weeks ago. They may well be nesting again, but their nests are usually well hidden in dense bushes. Peaceful Dove – we saw a pair mating and they have been hanging around close to the house for many weeks. I have yet to find the nest – in part due to a very bad back at present. Crested Pigeon – this species always seems to be breeding, but they chose a bush quite a distance from the house this spring. Spotted Turtledove – again, due to my back I haven’t yet found their nest. Galahs – this one is tragic. After many attempts at breeding over several years in a tree hollow near the house they finally hatched a brood of young, only to see them die in the nest during an unseasonably hot spell several weeks ago. Common Blackbird – this species often makes a nest in our garden shed, but this year they seem to be nesting next door and only visit our garden occasionally. Australian Magpie-Lark – again, this species has chosen to nest in the neighbour’s tall trees. They visit our garden frequently to catch food for the young. White-winged Chough – another species which visits frequently – except in recent weeks. 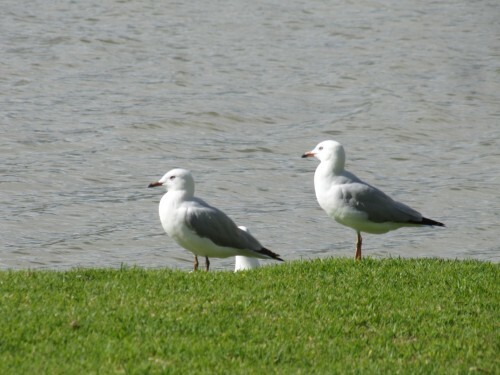 I often see them down the road about a hundred metres away, so they are probably nesting there. Little Ravens – although several of this species visit almost daily, I have yet to record them nesting in one of our trees, preferring to keep away from the magpies’ nest, I presume. White-browed Babblers – it has been quite a few years since they last nested in our garden but they are regular visitors – except in recent weeks – they must be nesting somewhere nearby. Superb Fairy-wren – our resident pair still seems to be around the house garden, but they are very quiet and secretive about the location of their nest. Cuckoos – we have heard the calls of the Horsfield’s Bronze-cuckoo a few times several weeks ago but have seen no evidence that they stayed long enough to nest. Other possibilities: White-plumed honeyeater, Singing Honeyeater, Spiny-cheeked Honeyeater, Yellow-rumped Thornbill, Weebill, Striated Pardalote, Spotted Pardalote. Last week our neighbour popped in unexpectedly. We hadn’t chatted to her for a while so she was most welcome. She has known for years that I was interested in birds and had really enjoyed an illustrated talk about birds I gave some months ago to the local Senior Citizens group, Interestingly she had a bird field guide in her hand, open to a page showing a photo of a Chukar Partridge. Her simple question was: ‘Is this bird found around here?’ She had never seen one before and was struggling to understand why she never seen it. She had been taking her dogs for a walk up the hill from our place. This is on the edge of Murray Bridge in South Australia and she was walking along the road through the start of an adjacent farming area. This species is native to large areas of Eurasia. It has been introduced into Australia and I presume as game bird. 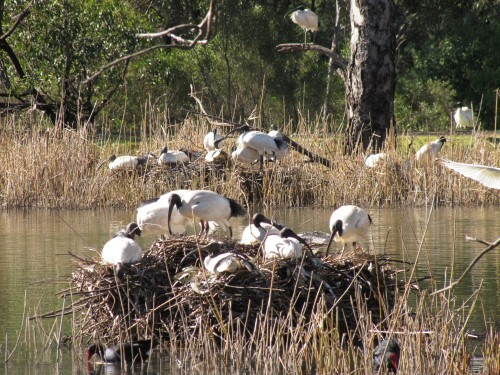 In fact, some years ago some birds were released in the Gulgong area east of Dubbo in NSW. They never became established as a self-sustaining population. 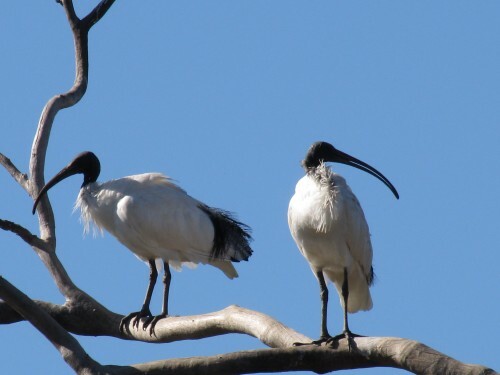 As there have been no sightings in recent years it is presumed they are extinct in that area. So where did the bird seen by my neighbour originate? 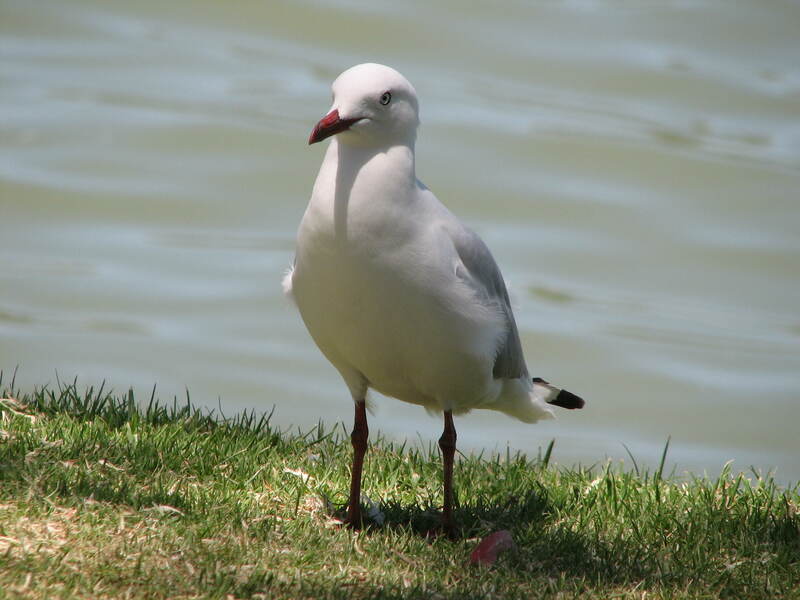 Interestingly, a year or so ago my cousin, who also lives here in Murray Bridge, sent me a photo of one in his garden. I can find no reference to this species being kept as an aviary bird though I guess that is one possible explanation if one has escaped. Perhaps someone has kept a few as meat birds and one escaped. Being a member of the pheasant family I guess that they are good eating. It is a wonder it has survived as we have quite a few foxes prowling the area. I have no answers to these perplexing questions. You can read more about this species here. You are currently browsing the Trevor's Birding blog archives for November, 2015.